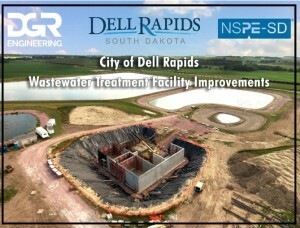 The City of Dell Rapids existing wastewater treatment facility lacked the capability to provide adequate treatment of the City’s wastewater. 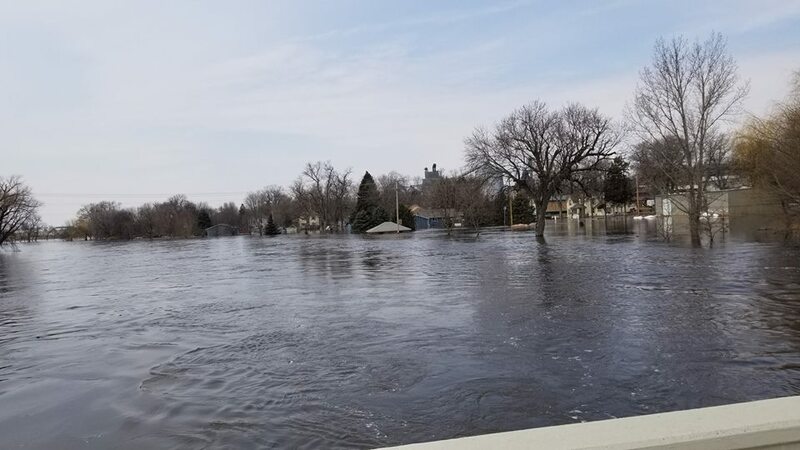 The City of Dell Rapids is a growing community that wanted to position themselves to welcome newcomers and not be constrained by a treatment system with limited treatment capacity. The City understood that discharge limits are only going to become more stringent in the future, and they needed a treatment system that was easily expandable and adaptable to meet these future limits. 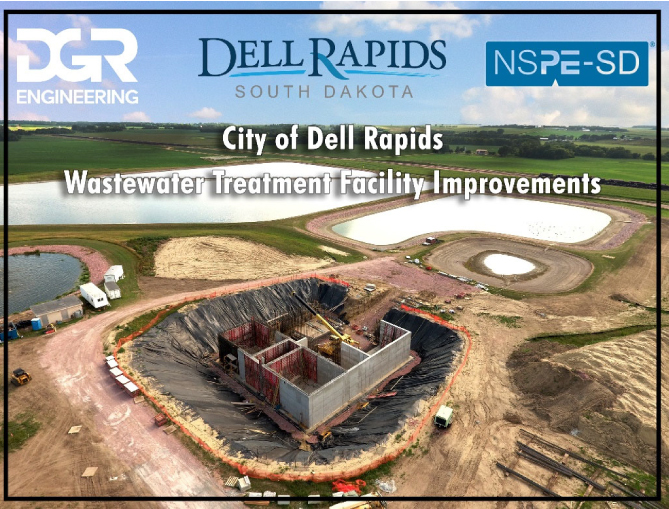 The City selected a sequencing batch reactor (SBR) because it met these requirements and set Dell Rapids up for future growth and success. The overall project construction cost was nearly $5.8 million. 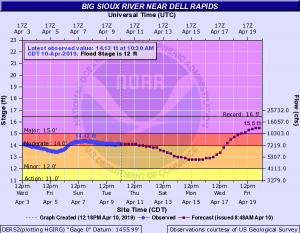 The Big Sioux River Basin in eastern South Dakota has experienced repeated flooding in recent years. In 2014, a major flood in the lower basin revealed shortcomings in understanding and predicting flood-event behavior. 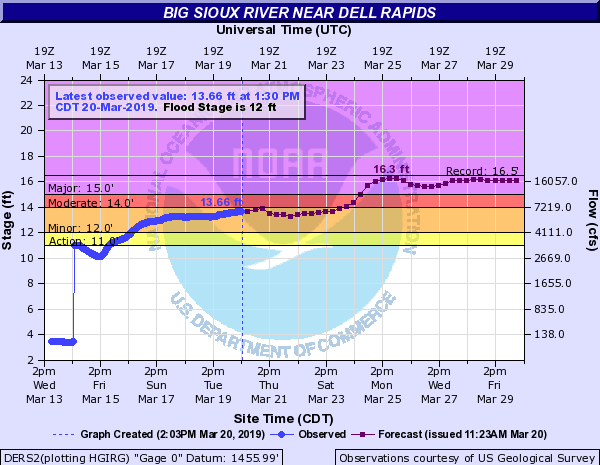 In 2016, the State of South Dakota commissioned the development of the Big Sioux River Flood Information System. The Flood Information System is a two-part web platform including access for the public and flood-response teams. 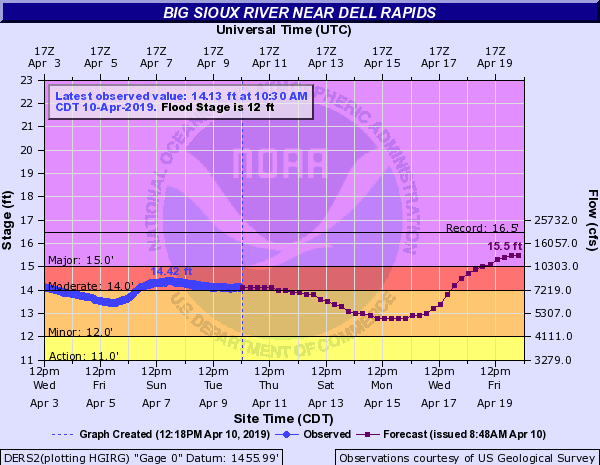 The first part is a public site http://www.bigsiouxfis.org/ with access to stream conditions at over 50 locations throughout the Big Sioux River Basin and a library of over 8,000 inundation maps, representing flood scenarios for five different communities. The second part is a site reserved for state and community officials and includes access to real-time flood inundation forecasts. When flood events are predicted, the hydro-logic output is run through models and predicted inundation maps are loaded to the web platform. The Flood Information System provides the public with an understanding of potential flood risks and gives flood-response teams accurate information for decision making during flood events. Already in 2018, the system has proven its value during two separate events near North Sioux City. 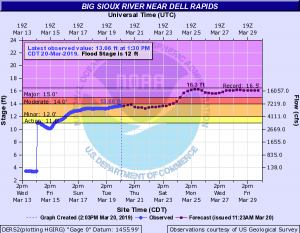 As significant amounts of rain fell over parts of the basin upstream, there was a lot of uncertainty in the severity of flooding that may occur. The Flood Information System predicted less-severe impacts than previous forecasting methods. Flood response managers had the confidence to hold off any drastic measures well in advance. The Flood Information System predictions held true, accurate to within 0.1 feet of observed flood stage. The total project cost was $1.3 million. Krista May is a Project Engineer at Infrastructure Design Group, Inc. of Sioux Falls. Krista has a Bachelor of Science degree in Civil Engineering from South Dakota State University. Krista has played the lead engineering role for multiple large-scale complex projects in her 8 year career. Her lead role includes roadway design, traffic control, lighting and signals, traffic impact studies, drainage, erosion control, water main, pavement marking, signage, and sanitary sewer. Krista has been involved in nearly $130 million worth of civil engineering projects. Krista is involved in numerous professional and community organizations including: Alpha Omega Epsilon (AΩE) (President), MATHCOUNTS Competition (SE South Dakota Chairperson), SD Engineering Society (Eastern Branch President-Elect), American Society of Civil Engineers (ASCE), Young Professionals Network (YPN), and Sioux Empire United Way (Emerging Leaders Advisory Committee). Krista likes to read, attend theater productions, and attend her cousins’ sporting events. Lance Weatherly is a Principal Engineer for the City of Sioux Falls providing engineering support for the Public Works Stormwater division. Lance is responsible for the planning and execution of the $44 million Stormwater Capital Improvements Program to improve neighborhoods and promote comprehensive growth. Lance’s professional career has spanned 15 years in the private and public sectors in Eastern South Dakota. Lance has Bachelor and Master of Science degrees in Civil Engineering from South Dakota State University and a Master of Business Administration from the University of South Dakota. Lance obtained his professional engineer licensure in 2008 and is licensed in South Dakota. Lance is active in the South Dakota Engineering Society, having served in different leadership roles and is the current president of the Eastern Chapter. Lance enjoys giving back to personally and professionally to the Sioux Falls community and mentoring the upcoming generation of professional engineers. Lance enjoys spending time with his family and traveling to explore new cultures. Dell Rapids will be welcoming a new restaurant to Main Street. Papa’s Pub & Eatery will be opening soon for all to enjoy. Papa’s Pub & Eatery is named after David’s late father, Daniel. “We know his father is with us every single day, so naming this restaurant in honor of him just made perfect sense,” Rebecca said. Together, David and Rebecca have over 30 years in the restaurant industry. “From dishwasher to operations director, we have done it all,” Rebecca explained. “David is well versed in both the kitchen and the front of house, whereas I strictly stay in the front of the house.” The Ohayons also have a leadership team in place that has many, many years of restaurant experience in the dining room as well as the kitchen. “David’s management style is unbeatable,” Rebecca explained. “You work with him, not for him, and I truly believe that is why he has been extremely successful everywhere he has worked.” David throughout the years held many positions with companies such as Spezia, On the Border, Johnny Carinos, Beef ‘O’ Bradys, The Willows at Willow Run and more. “After seeing him work so hard for others, I am glad he is finally going to do it for himself and our family,” Rebecca stated. Rebecca has worked in the restaurant business as well, at places such as The Monarch Steakhouse, Cody’s Tavern and Grill, The Minnehaha Country Club and Johnny Carinos. The menu will be mainly American fare with some of David’s experiences and cultural background sprinkled in. Papa’s Pub & Eatery will offer other types of food such as Mexican and French along with other countries in the Mediterranean region as weekend features. “The menu isn’t quite finalized, but you can expect to see a few appetizers, burgers, steak/chicken/shrimp entrees, pastas, salads, specialty sandwiches and soup options,” Rebecca explained. 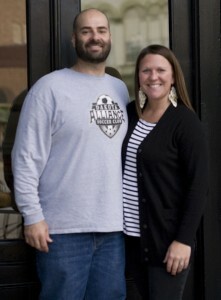 Papa’s Pub & Eatery will offer a lunch menu, dinner menu, children’s menu as well as desserts. A full bar will also be included in the restaurant. Papa’s Pub & Eatery plan to be open Tuesdays-Thursdays 11am-9pm; Friday and Saturday 11am-10pm. “We will eventually consider opening on Sundays in the morning,” Rebecca explained. “We want to offer an atmosphere for everyone – family gatherings, date night, business lunches, rehearsal dinners, you name it!” Papa’s Pub & Eatery plans to open their doors early December. What started as a community project after frustrations over garbage and trash at the dam area in Dell Rapids has led to an annual event. The “2nd Annual River Cleanup Day” is planned for Sunday, October 7th starting at 11:00 a.m.
Kiley Stone organized the annual event last year and is asking the community to join in the cleanup day to keep the local parks of Dell Rapids clean. Stone invites everyone to the event and says that folks can start a team, bring the kids, or grab a neighbor to help at the event. The group will be cleaning up trash, glass, and other debris along the dam and along the river. Trash bags will be provided, but volunteers are encouraged to bring gloves to protect hands. It is also suggested to wear jeans, good shoes, a bright shirt, and a hat. A portion of the final phase of the Highway 115 project has completed. The north bridge from 3rd St southward out of Dell Rapids was opened by the South Dakota Department of Transportation in the late afternoon hours of Wednesday, September 5th. The north bridge has been closed to traffic since December 4th, 2017 to start the final phase of this major highway construction project. “It will eliminate the detour, which is be a big relief to the community. It’s been a slog,” said City Administrator Justin Weiland during the Dell Rapids City Council meeting on Tuesday, September 4th. Construction still continues on Highway 115 from the four-way stop by T&Cs and Dells Auto westward out toward the interstate as projects all across the state are falling behind schedule. “T&R is doing the Tea-Ellis road, and they’re talking about not even tearing up sections that are supposed to get done this year, and calling it quits and finishing where they’re at right now because they’re not going to get to it. Hopefully they shift some of that man power over here. Everybody’s way, way behind all across the state right now. We might be stuck with this late into the winter season,” Weiland mentioned during the council meeting. The first phase of the project, the replacement of the south bridge on Highway 115 and highway replacement to 248th St., began in April of 2016. That section was completed in a little over a year with the bridge and new road opening May of 2017. The second phase of the $18.8 million Highway 115 project was the replacement of the Interstate 29 interchange at exit 98. That portion of the project was re-opened to traffic on November 29th, 2017. Minnehaha County Sheriff Mike Milstead along with Minnehaha County Sheriff’s Office Deputy Mike Walker gave a report of what the office is seeing throughout the county. The presentation was given during the Dell Rapids City Council’s regular meeting on Monday, May 21st. Sheriff Milstead noted that the drug cases in Dell Rapids stayed nearly the same from 2016 to 2017. Dell Rapids had 29 cases in 2016 and 30 in 2017. However, Sheriff Milstead said the meth arrests and overdose deaths in the county have doubled. There were 11 overdose deaths in Minnehaha County in 2016 and 21 in 2017. “We didn’t use to see meth overdoses, but here’s what’s happening. Our percentage of purity and strength of our meth coming into our community is nearly 100%,” said Milstead. He also noted that the meth epidemic is something the sheriff’s office struggles to handle. Milstead said that over half of the violent crimes and burglaries in the county are related to meth use. Meth isn’t the only the drug being seen in the county. Milstead noted that seven of the overdose deaths in 2017 was related to heroin. “I don’t think I’ve ever said the word heroin in Dell Rapids. I never thought that I would, but heroin is in our communities now,” Milstead added. Despite the shocking statistics given by Sheriff Milstead, he praised the council and the community of Dell Rapids. “I have great respect for what you do and the challenges you face. It’s really nice, actually, to come up and listen to a setback issue being a major thing that you’re handling, and you’re not dealing with a crisis that we’re seeing in other communities. 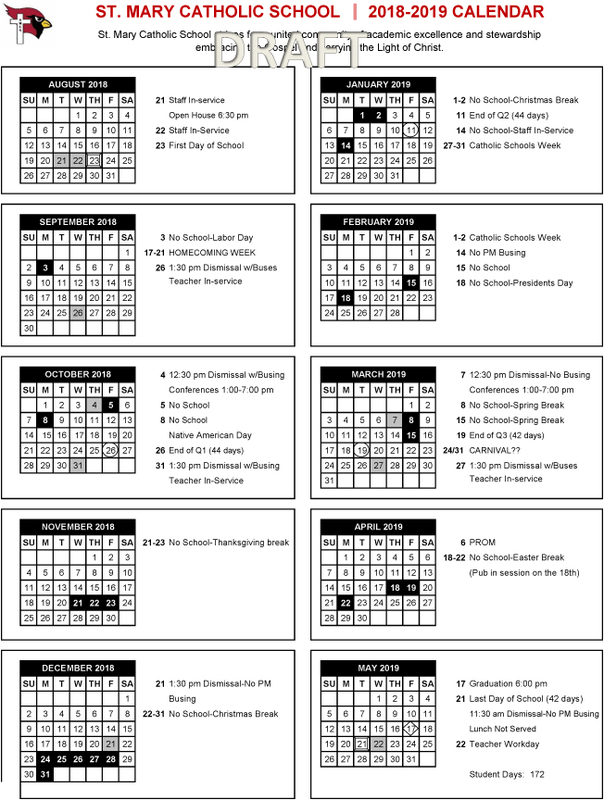 I think there’s a reason why people live in Dell Rapids. 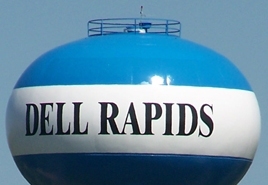 They want to keep it like Dell Rapids and will fight to keep it that way,” Milstead commented. Officer Walker provided a few comments as well. He noted that while he doesn’t know everything that goes on in the school, he does hear a lot. Walker said he that he does hear a lot of the trends and said that it goes up and down every year. 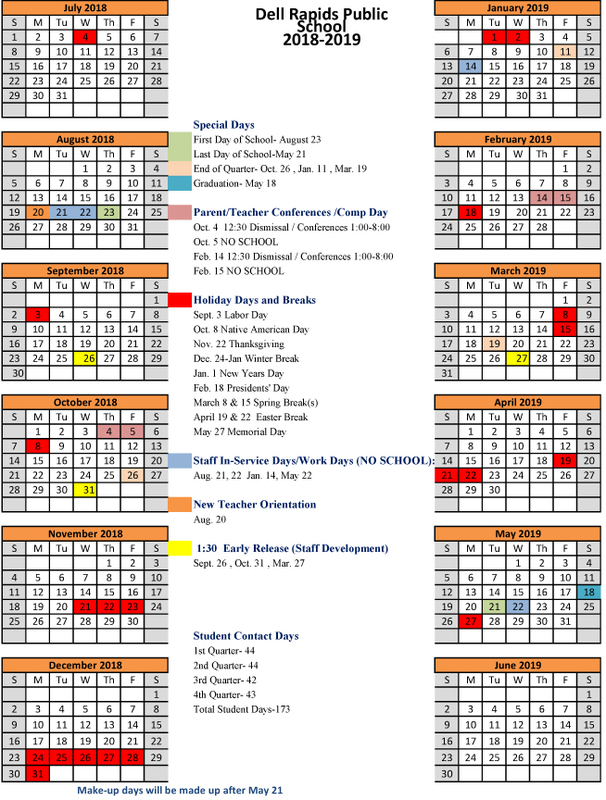 “This year has been a really, really good year at Dell Rapids I think. I’m not here to tell you that no kids are using marijuana or drinking and stuff, but I just did not hear the trend that I have in the last three or four years,” Walker said. Walker also noted that while he didn’t hear some of the same trends in the school when it came to marijuana or drinking, he did mention that vaping is now becoming more of an issue. Sheriff Milstead and Officer Walker also touched on other drug related items, apps and technology that the office is using or hopes to use, and social media. The entire nearly hour-long report can be viewed in the video.